Here's a tale of 3 cows.... We are calving 400 head out, and we just got nicely started on the cow herd yesterday, with 11 calves since Midnight Mar 16. Our protocol for cows is that if they have not made progress within 1/2 to 1 hour we get them in and check them out. This includes cows that are 'just' wandering around. Or that 'just' are acting a little off or uncomfortable. I'd rather investigate a cow that isn't doing anything, than pull a dead calf. For heifers we give them a little longer, usually wait until 1 hour is up. We have cameras installed in our calving pen (there's about 160 cows in there now) and in the barn. We like to check cows about every 4 hours, to make sure there are no problems. Yesterday, we had been sorting more heavies off, and when we went down to check, after we were done sorting, we found 1 new calf and 3 more in the process of calving. One was a first calver, and she had decided she loved the new calf. One was progressing nicely, and the other had the placenta coming with the water bag.... We took the heifer to the corral and the cow to the barn. #196,(4 PM, Mar 16) the cow that had the placenta coming with the water bag....It had only been about 2-3 hours since we had looked at the herd last, she was not actively doing anything at that time. Let me tell you something....IF THE PLACENTA IS COMING BEFORE THE CALF.....VERY, VERY BAD!!!!!!!!! This is a BIG sign that there are problems, and very likely a super stressed or DEAD calf. If you see it, do not ask questions, get her in and get the calf out!!!! I have no idea why she was having problems, 90 lb calf, so size shouldn't have been an issue. Calf was coming the right way...2 feet and a nose....But regardless, she was having issues, she was not, and did not push, we used the calf puller, and got him out. We were lucky, this calf was fine, and very lively, I think he couldn't wait to get out! Outcome, healthy cow, healthy calf (I've seen more dead than live calves in this scenario). #116, (After Midnight, Mar 17) I do the last check before going to sleep, around Midnight. Then we share checks (on the camera usually) through the night. At midnight, I noticed her, water bag out, wandering around. And by that, I mean wandering enough that I had trouble keeping track of where she was. This is unusual, once the cow has the waterbag, they usually have picked the spot to have the calf, sometimes they will move, but not wander. I checked my records, to see what she was bred to...same bull as some of the heifers and those were mostly 60-70 lb calves. So, I decided to keep an eye on her, rather than go to sleep. At 1:15, she was still wandering, (and this is longer than we usually like to give them...but 1AM....) At this point, I knew there was a problem, I went out and got her into the barn, literally she walked right up and in for me. I didn't have to get DH up. Got her in the Maternity pen, checked her out, I have no idea what the problem was....2 feet and a nose...calf weighs 83 lbs, so not big....Got the chains on and tried pulling, but no luck, I am not strong enough. Got the puller on, and literally hardly had to pull, she started pushing and basically had it on her own, but the cleanings were coming with the calf, glad I didn't wait any longer. Outcome, healthy cow, healthy calf. #219, (3 AM, Mar 17) we knew she was really close, figured it would be overnight as well. She's a 7 year old cow, never touched her before. After pulling #116 calf I wandered back through the calving pen. Just to take a last check before going to bed (1:30 AM). She is starting to calve, has the waterbag as I walk by her, she stands up. OK, that is fine, she's done this many times. Nothing else going on, so I get in just before 2 AM. Put the camera right on where she is standing there just chewing her cud, and head to bed. When DH checks, he should see her. Of course, I cannot get to sleep any ways, so @ 2:30 I get up to check, and she hasn't moved....this is unusual, but decide to wake DH, tell him what is going on and we give her another 1/2 hour. I go to sleep, she is his problem now. @3 AM she still has not calved, so he runs her up to the barn, she has an upside down calf in her. He straightens it out and pulls it. He gets in @4 AM Outcome, healthy cow, healthy calf. This one would have very easily been a dead calf, if I hadn't walked out to look at 1:30 I would have never known she was calving, on the camera she looked like a content cow chewing her cud. She would never really have started pushing as nothing will enter the birth canal to instigate contractions. Sometimes these births will not even have the waterbag present. Breech births can be the same. 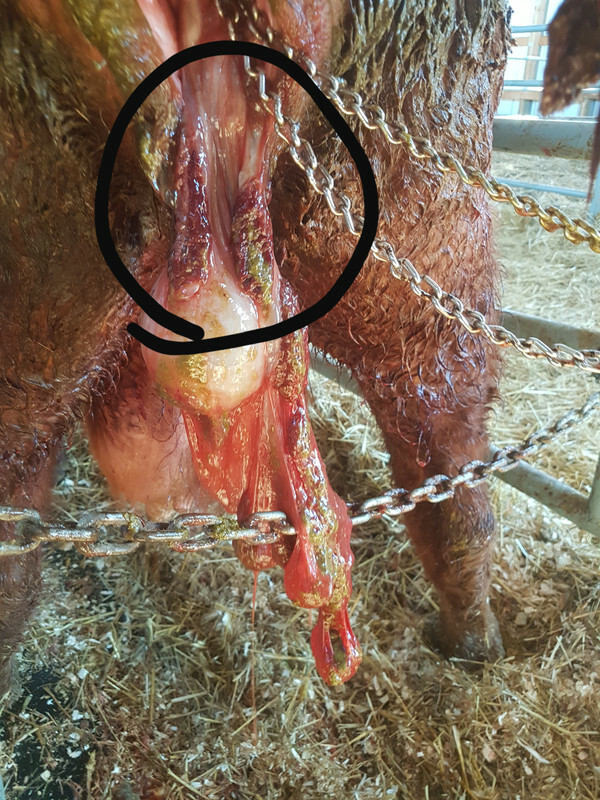 If you ever get a handle on what causes those normal presentation, placenta first calves, I would appreciate knowing. We had a lot of trouble with that scenario last year. Mostly in heifers but some cows too. And mal-presentations can be a death sentence for sure. My spidey senses start tingling pretty quick when things are off and into the chute for inspection they go. Had a cow the other night that appeared to be calving but nothing was happening. No straining, no nothing. 2:00 in the morning, didn't think I could have a nap with the way things were going so put her in the chute and low and behold a tail first calf. Followed by a back feet first calf. Last year i had a cow getting up and sitting down for an hour or so, got her in and checked her out. Not dilated at all. Everything else fine, could feel what i thought was a foot but could bend one way or another so couldn't tell a position. Next day still wasn't right, got vet in and he couldn't work it out either but she was due so we did a cesarean, live little heifer. Calf was upside down with one leg back. She could never have dilated because nothing pushing on cervix. Vets thoughts were a couple more hours would have been too late. I agree, with the dark orange sludge the calf was well cooked. This cows sixth calf and all others were born with a couple of pushes. All heifer calves too I'll add. Vet said she would calve again no worries. No way i thought, then i got curious.....she is due in 15 days....starting to wonder what the be nice i was thinking. Yesterday we saved a set of twins. Both coming front feet first. Should have been no problem for the cow, but the first calf was in the sac, so we were really watching her. She got the first one out to the shoulders, then nothing. When we finally got her caught (she wanted to kill), found that she had a second calf, and it had 1 foot up coming under the second calf. That was enough to stop the first calf. Pushed the first calf back in a bit, got that leg out of the way, and out they came. Last edited by Randi on Tue Mar 19, 2019 12:27 am, edited 1 time in total. Same to you, lol. We see one or two a year. I don't worry about malpresentations happening again in the same cow. I've got the records to back it up. Other than one cow, years ago that had 3 backwards calves, I don't think I've had a cow have more than 1 malpresentation in her life. We've had a terrible run with backward calves this year. Have had 3 of them so far. Only one didn't survive as she was one of the first to calf so we weren't really expecting her to be close yet. Last edited by Jake on Tue Mar 19, 2019 4:28 pm, edited 1 time in total. We started the year with malposition calves. Backwards, flexure, one we saved one we didn't. Saved both cows. Then I had one cow that seemed to be in horrible pain. I watched her for an hour and then called the guys. She was ready for help and offered no resistance in the field. Calf pulled by hand, but was a monster. All I can figure is it seemed her contractions were not strong enough or the calf planted her back legs on her hip and did not want to come out. Saved both but if we let things go till morning, we could have found a dead calf and a paralyzed cow. Her sister did the same, very big calf but not too big for her.. Just couldn't get it out. Pulled by hand and came out easily...Would have found a paralyzed cow and dead calf if we hadn't gone back out after dark.. Again, she was wanting help and I shined a strong spotlight at her so she couldn't see what we were doing. Worked great, she stayed put without roping or tying. I'm also seeing more cows stand to get the hips out letting the calf fall to the ground. Its been an odd year.